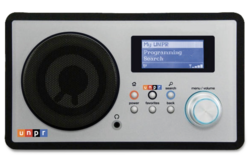 This attractive radio can receive UNPR from anywhere in the world, and can be yours for just 500 big ones! UnNews Public Radio is the audio section of UnNews. It presents you with the dubious thrill of hearing the people who write UnNews articles attempting to read them out loud. It is one of several Uncyclopedia projects featured in the regular Uncyclopedia Podcast. 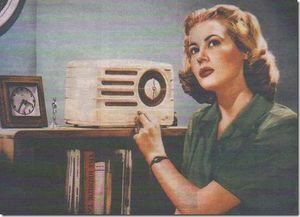 Have you ever listened to NPR? It's almost exactly the same as that, except we're more Verry Gross than Terry Gross. For help with listening to audio files on UnNews articles or for help with uploading your own UnNews audio files, please see here. For those of you who are strapped in and ready to go, here is a list of the 50 most recent UnNews Audio recordings. For even more aural pleasure, you will find a list of all articles with UnNews audio here. "Mr. Laurent, having left the Western coast of France on Tuesday evening, crossed the channel and entered the town's harbor at exactly 10:41, thus becoming the first headless man to do so." 18 Feb 2016 - Will you marry me, Katie? This page was last edited on 11 March 2019, at 21:08.